When I first sat down over the summer to start doing some serious work on In The Gloaming I didn’t know what a chapbook was. I had never heard of Michael Marshall Smith. I thought horror was all shiny, fat, black books with skulls on the front, wedged into the pockets of teenagers’ school blazers. I didn’t know anything about modern horror, and I wasn’t expecting to find much that I was missing much. Still, I settled into a Costa with a pot of tea, and The Mammoth Book of Best New Horror: No. 19 . Half an hour later, my tea was cold, the book was closed in front of me, and I had been staring into space for so long the Costa staff were beginning to worry. I had been punched in the gut by the very first story. 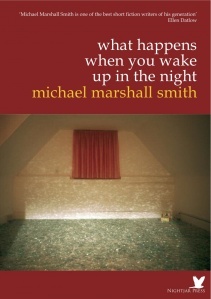 I had been punched in the gut by Michael Marshall Smith. I was stunned. Where I had been expecting pointless gore and bad prose, I had found something strangely beautiful and utterly nasty. I had found ‘The Things He Said’, a vicious tale with a killer ending. I wanted to read more. I was hooked. Almost the whole anthology was great (it had a much higher hit rate, in my opinion, than this year’s effort: the 20th book in series), and, in one book, it changed my opinion of a genre. In short, if you’ve £3 you would otherwise have spent on the gaming tables, loose women, or intoxicating beverages, why not pop on over to Nightjar Press, and spend it on a signed, limited-edition chapbook (whatever that may be). You’ll get chills, the satisfaction of supporting a small publishing effort, and an actual collectible thing.